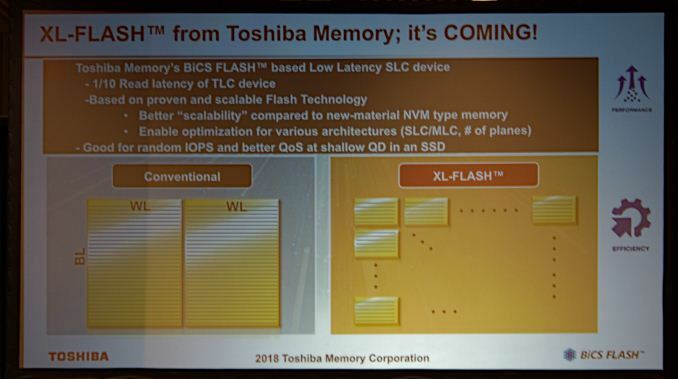 Earlier this week at the Flash Memory Summit or FMS, Toshiba announced its new variant of 3D NAND flash memory, XL-Flash made with the same process as their 96-layer BiCS4 3D NAND, XL-Flash uses a shorter bit and word lines to create more planes than the two to four seen on current NAND products. Toshiba claims it will have one tenth of the read latency of current TLC devices while being based on proven scalable flash technology with better scalability compared to new material NVM type memory and will enable optimization for various architectures such as SLC, MLC and differing number of planes. Toshiba also claims in the slide it will be good for random IOPS and better QoS at shallow queue depths in an SSD compared to current technology. XL-Flash definitely does sound like it’s very similar to Samsung’s Z-NAND concept they floated out recently, both of which seek to change existing NAND flash tech into something that can compete against the new non-volatile memory such as Intel’s 3D XPoint memory. Unfortunately Toshiba didn’t mention anything about how these future products will be priced or even the capacity would compare to current NAND products on the market, but I would take an educated guess that density would be lower than taking their 96-layer TLC and simply treating it as SLC NAND. Toshiba has said XL-Flash is intended for enterprise and datacenter storage applications, so don’t expect to see it available in consumer channels in the near future. This is a part of our coverage on the Flash Memory Summit, for more flash related news be sure to check back with the site and give us feedback on if our readers are interested in this sort of content going forward.